For those coming to play golf in Ireland a visit to Dingle will mean playing on ireland's most westerly golf course. Ceann Sibeal, a challenging 18 hole links course is just a short drive from Dingle Benners Hotel, along the Slea Head Drive to Ballyferriter. Here you will play against the backdrop of the Atlantic, with views over the Blasket Islands, Sle Head and the famous Three Sisters, a dramatic and unique backdrop. Ceann Sibeal, Dingle Golf Links is just one of the course on the Dingle Peninsula. Many guests also like to play at Castlegregory Golf Links. We are also always happy to arrange tee times and transfers to Ballybunion Golf Course, Tralee Golf Club, Killarney Golf Club, Dooks, Waterville or even to the Old Head in Kinsale. For golf groups we do offer special group rates and packages to include golf. 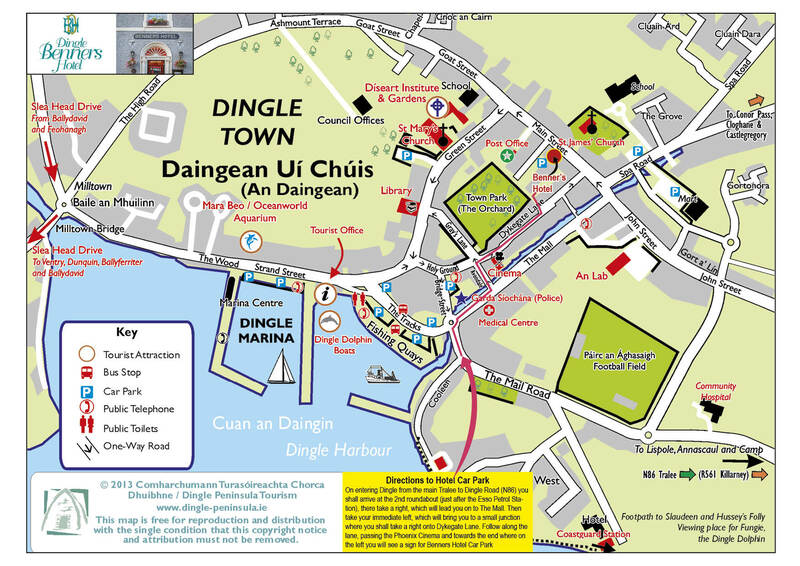 The hotel's location right at the heart of Dingle town with best of Dingle's restaurants and bars on our doorstep makes it a perfect location for golfing groups.